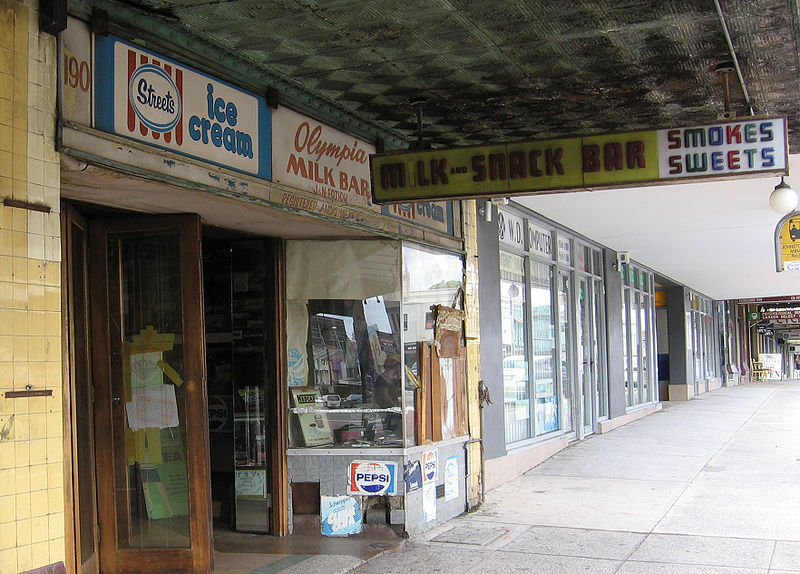 The Olympia Milk Bar is a cultural icon situated on Sydney’s main traffic artery, Parramatta Road, Stanmore. Considerable folk lore has built up about the aged proprietor and the opening hours of the Olympia. The interior of the Olympia is much like a time capsule, albeit a quite poorly lit one. There are displays of old chocolate boxes and vintage advertisements around the shop. The milk bar contains facilities for making milk shakes and ice creams, but the selection of chocolate bars now seems to be fairly limited. The Stanmore Cinema was formerly adjacent to the premises, but was demolished in 2002. The upper floor of the building once contained a hair salon, known as the Olympia Salon. The owner is the inspiration for the song “Dr Death” by Sydney garage band Sheik The Shayk. An excerpt from an upcoming novel by Anthony Macris (Capital, Volume One, Part Two) features an exhaustively detailed description of the premises.Further detailed descriptions of the owner and the premises can be found in the book Strawberry Hills Forever by Vanessa Berry. The shop window that once offered a view of the counter where a delicious milkshake might be mixed, is now held together by recycled cardboard and covered in old chocolate and soft drink advertisements, dating back 30 years. Upstairs are the remnants of what was an old hair salon, The Olympia Salon. This is believed to have belonged to the owner’s wife. 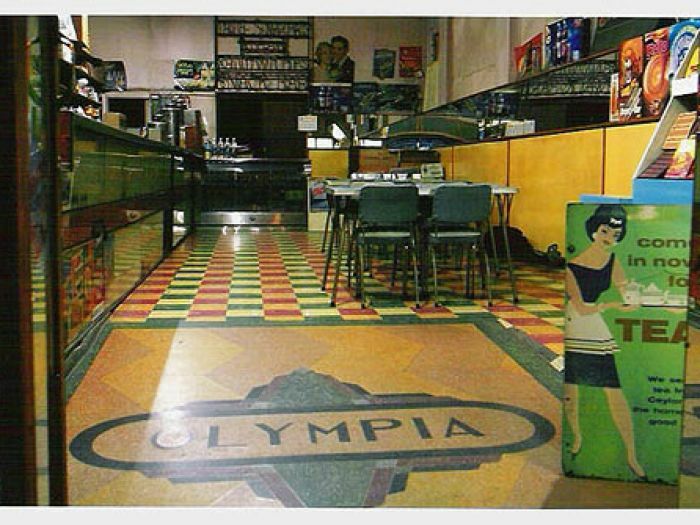 Rather than the promise a milk bar would usually hold of soft drinks, chocolates and of course milkshakes, the Olympia instead lay dormant. No energy, no excitement, not even light. Bruce Zhang pointed out, “He never turns the lights on, [not] even at night.” The milk bar is dark except for the far left back corner where a fluorescent light globe remains lit. The advertisements that circulate the store’s walls and windows create the darkness that absorbs the rest of the room. “No people, no lights. When people, lights!” exclaims the owner. Could this then mean that there are no people coming to visit him, if so, does he want visitors? No one nearby knows much about the milk bar and its owner; whose name is a toss up between Nicholas and John Fotiou, his brother being the alternative to himself. A worker at the news agency across the road commented, “Everybody asks who, I don’t know nothing, what can I do?” A lot of locals believe his name to be Kirie, whilst others call him “Dr Death” or “Dracula”. Those brave enough to enter ‘Drac’s Milk Bar’, would be greeted by a short, very pale, silver haired man with homely eyes that hide the story of someone saddened by misfortune. He smiles attentively; his teeth show signs of aging and traces of gold from heavy dental work. This man, although he may appear to be a frightful creature of a dark den, is a quiet, almost cheeky but indeed friendly man. If game enough to try a milkshake, one would only be charged $2.90. Should chocolate be your desire, then you’ll have to wait, for the owner informs that he is “just waiting on an order to come.” By the appearance of the empty discolored chocolate display boxes that wallpaper behind the counter, the customer will be waiting a long time. The building in which the Olympia Milk Bar stands erect was built in 1911, this same structural skeleton remain intact today. It was in 1937 that the bottom floor of the building was turned into a milk bar. A hair salon and theatre had been opened in previous years. All three businesses ran under the heading ‘Olympia’. In 1964 two men, John and Nicholas Fotiou, took ownership of the building and the small businesses that came with. 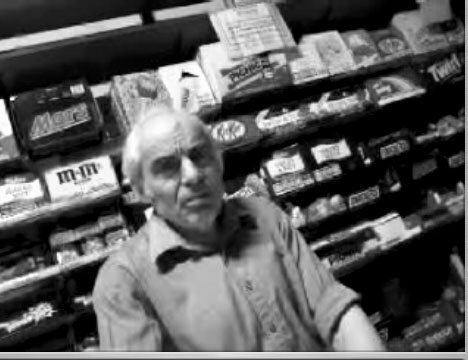 However today, there is only one man who stands in the milk bar; of the others only shadows remain. The Olympia Milk Bar has been attracting the attention of intrigued by passers for years. In mid 2007, a Facebook group was established and since then has gathered no fewer than 700 members. There is a bus stop directly outside the store that could be to blame for the small but obsessed group of followers. Whilst waiting for a bus, they may have noticed the oddness of the Milk Bar. That sense of waiting is something intrinsically aligned with grief and depression. Suffering from an extreme case of both I have spent almost the last decade of my life wasting my existence as though I am waiting for something. It comes from the fact when tragedy hits your family and takes them from you everything is about waiting. Waiting for phone calls and news. Waiting rooms of doctors. Waiting in hospital’s. Waiting by bed sides. Waiting for inevitable death. Waiting with the body for the doctors and coroner. Waiting for the funeral home. Waiting for the hearse. Waiting, waiting, waiting. Then when it’s all over, you find yourself incapable of doing anything but; waiting. After many years of introspection trying to understand, as the agoraphobic nature of depression turned me into a shut in, and as everyone slowly drifted away leaving me truly alone I began to realize what it was all about, what I was doing. Waiting to join them.